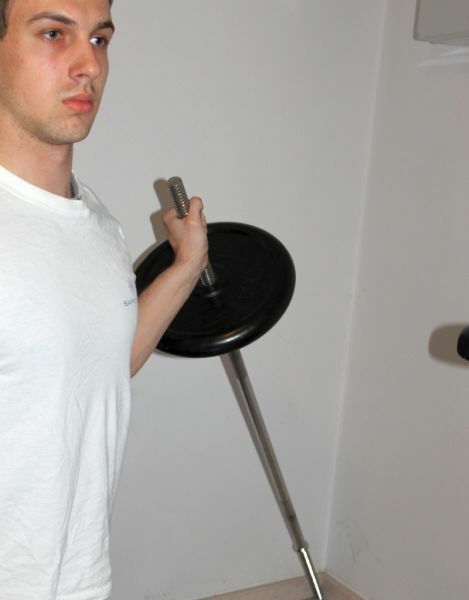 What can you do with a barbell with just one weight? Nothing? Wrong, you put the end without weight into a corner and do a dozen unilateral exercises with it! Here’s the cornerbell! I somehow felt it was a time for a change of pace, so here’s a fun and practical article. We’ll demonstrate the use of a simple training tool – the cornerbell – which allows you to perform unilateral training without DBs. So, the primary purpose of it is providing people who don’t have dumbbells at their disposal with an efficient tool for unilateral training. The secondary purpose deals with simply ushering more variety into anyone’s training arsenal. Unilaterally means working one side of the body at the time. Often people misunderstand this and think that any exercise which has your limbs moving independently of each other is unilateral. This is not the case – e.g. doing standing DB curls with both arms at the same time does hit each arm independently, but it’s still not unilateral. A question that might arise in this entire discussion is what your first, basic training tool should be – a barbell or a pair of dumbbells. Let’s leave the trivial answer, that you should ideally (or eventually) have both at your disposal, and see this from the perspective of an aspiring trainee who lacks either money or determination to spend some of it on (home) gym equipment. In my opinion, your first fitness acquisition should be a barbell. The dumbbell side usually throws the argument that DBs offer more training versatility, which is true, but irrelevant in this case. Regardless of your level of fitness, and especially if you’re still at beginning stages, you need to be able to do the basics – press, row, squat, deadlift – and all these major compounds work better with a barbell. The second thing that could be of importance here is mustering enough weights to allow for fairly long-term progression. Making your DBs heavy means having lots of small plates, which can be quite expensive if your buy them first hand because, at least where I live, prices of weight plates don’t go up linearly, i.e. you’d expect to pay twice as much for a 20 kg plates than you would for a 10 kg one. In reality, 20 kg will be less than 50% costlier than 10 kg one, and a 5 kg will only be something like 20-30% cheaper than 10 kg one. The last argument in favor of starting with a barbell is the fact that learning movements is much easier and safer with a barbell than with DBs. A cornerbell is simply a barbell whose one side is loaded, and the other is fixed. The “fixed” part generally means jamming one end in a corner of your room/gym, hence the name cornerbell. A word of warning right away – the movement of the fixed end (fixed means that is stays in the same place, but doesn’t exclude the necessary up-down and left-right movements of the end itself) can damage your walls and your floor, therefore I recommend that your put some thick rubber between it and the wall/floor themselves. This rubber will eventually be worn out, but that’s not an issue, as long as your room is left intact. Ideally, the fixed end would really be fixed, as in attached to something heavier than the weights you plan on using on the weighted end. Some power racks have such an attachment that allows for performing T-bar rows, and the very T-bars seen at gyms have a similar structure around them. If you can make one, great, if not, it isn’t that much of an issue. You can get a similar effect by simply nestling the fixed end in the corner more tightly, or putting extra plates on top of it, but both these solutions, again, increase the risk of dealing damage to the surrounding surfaces. You can notice right away that the cornerbell can be used for bilateral movements, some being very desirable, safe and effective, such as improvised T-bar rows, but that’s not the main scope of the article, and you can easily turn the exercises demonstrated below to bilateral versions by simply gripping the weighted end with both hands and positioning it in the median plane of the body. The last thing I’d like to mention before moving on to the meat of the article is the issue with ROM on some exercises. Basically, the larger the diameter of the plates you use, the less ROM you’ll have on some exercises, up to the point that is becomes ridiculously short. Therefore, if you can, load the weighted end with smaller diameter plates, or at least load them with smaller plates first, so that the larger ones be left farther away from your body, thus less able to interfere with the ROM. You’ll see what I mean by that if you try these exercises by yourself. The following sections describe some exercises that can be done with the cornerbell. Some descriptions are accompanied by pictures showing starting and ending positions. There’s nothing inherently new or specific regarding form on any of these exercises that would require more detailed descriptions or demonstration videos. Covered exercises are categorized in a basic manner as presses, pulls and lower body exercises. Something to note right away – the length of your bar matters (no indecent allusions intended). If you have an Olympic bar, then you’re safe, but if you’re limited to a standard one (and most home trainee are), then you could face problems with the bar simply not being long enough for you to fully extend your arm while pressing or to get to your shoulder for calf raises. Naturally, the taller you are, the more evident this problem becomes. The solution to this problem is to either sit or kneel instead of performing the exercises standing up. I prefer the former (sitting) for better stability and more safety. 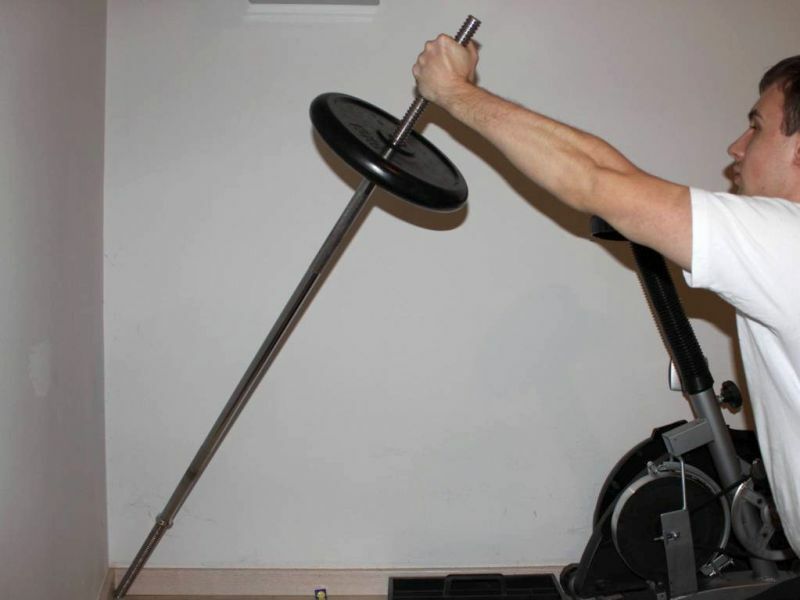 Side press – this is a prime example of an exercise you could never do with a barbell, and it might even work better with a cornerbell than with dumbbells if you work out alone and have problems getting heavy dumbbells into starting position. Of course, it lacks some components of regular DB overhead press (mainly the 3D one, which allows you to bring DBs together at the top of the movement – and this issue is evident is several cornerbell exercises), but it’s still great because it allows you to press in the frontal plane. The problem with the barbell is that, well, you can’t press through your head. It gives you two options – regular overhead press (a.k.a. “The Press”), and the behind-the-neck press (BTN Press or BNP). The former forces you to start with the bar in front of you, and actually push the bar away from you at midpoint to simply bypass your head, while the latter is usually frowned upon because it requires a substantial amount of shoulder girdle flexibility which some people just don’t have, and they wind up with a rotator cuff injury. The starting position during the side press. An important thing with this side press is not to cheat by moving your arms forward or rotating your body in such a way that the cornerbell is no longer in line with the center of your head. Any type of overhead pressing requires a degree of thoracic spine mobility, and if you don’t have it, work on it (by doing wall slides and similar drills) – don’t cheat by hunching or bringing the weights to the front. Keep the same posture as you would if you pressed regular dumbbells. The arm stretched. Note how barbell, head and body are still in line. Front press – a cornerbell is just like a dumbbell in some aspects – you can do your presses at whichever point you wish – at the center of your head (like the side presses described above), a bit more forward, or completely in front of your face like in this exercise. Another thing to notice about the front press is that you can use both pronated and neutral grip. This changes the exercise slightly. Floor press – you rarely see people doing unilateral chest training, but when you do, they’re mostly doing floor presses. Prone pressing just one dumbbell is cumbersome enough when done on floor, so when doing it on a bench it’s almost impossible to go heavy enough. Cornerbell has another advantage over dumbbells here, and that’s the fact that you most likely won’t need to get it up into starting position as the plate diameter will make the bar high enough even when the cornerbell is lying on the floor. Unilateral T-bar rows – these are exactly like bilateral T-bar rows, except that you’re pulling with just one arm at a time. I personally like the bilateral variant better, for stability and its unique way of hitting the middle of the back, but still prefer the unilateral version over regular Cornerbell rows (described below). Be very careful how you distribute your weight and avoid twisting your torso as you pull the weight up (this is a form flaw evident in almost all unilateral back exercises, but it should be more evident here since you most likely won’t brace yourself against anything for back support). The unilateral t-bar row with the cornerbell. Cornerbell rows – these are the cornerbell equivalent of DB rows. They’re similar to unilateral T-bar rows, except that they’re done with the bar at your side, which makes it much easier to lower your torso close to parallel to the floor, as well as to brace yourself against a bench with your free arm for back support. The starting position of the cornerbell row. The range of angles at which you can do this exercise will depend mostly on plate diameter used. This exercise is another reminder of the fact that CB isn’t a DB, since you can’t do arc rows with it. The upper position of the cornerbell row. 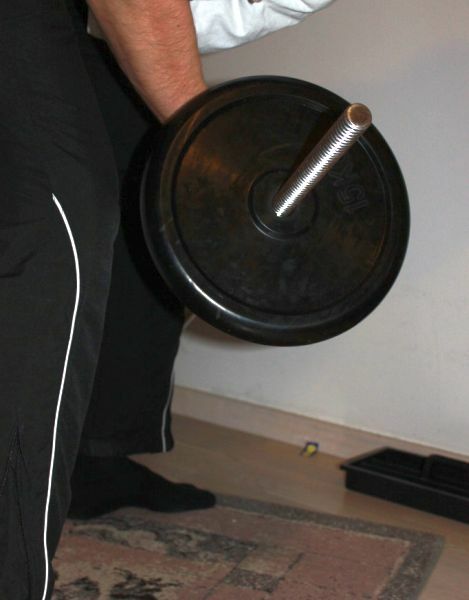 Cornerbell shrugs – this is a no-brainer: grip the weighted end of the cornerbell and shrug. Weighted pistol squat – the pistol squat is a difficult movement on its own, not so much because it requires strength, but for requiring a degree of balance and flexibility most people lack without practice. Once these become easy enough, you can, of course, opt to add external resistance, and a way of doing this is using a cornerbell. This is different then other commonly used methods of adding weight to pistols, such as with a kettlebell or a dumbbell, because you can’t really hold the cornerbell out in front of you as you would with those two. The way to go here is holding the cornerbell at your chest with both your hands. The weights used will most likely be very light, so you shouldn’t experience discomfort or have a problem with plate diameter. Full get-up – this exercise, commonly known as Turkish get-up, is usually done with a kettlbell. 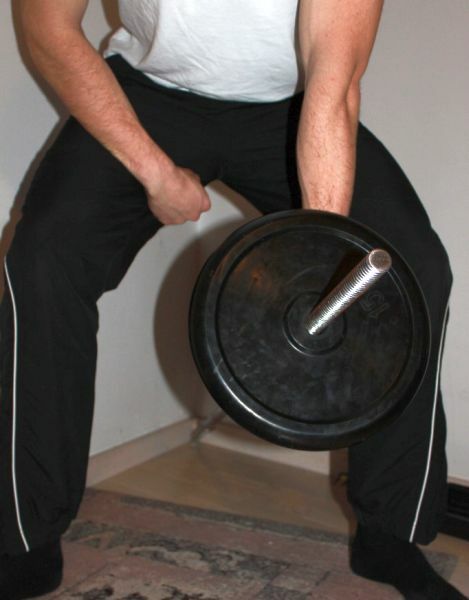 Doing it with a DB is heavier and more cumbersome because the center of gravity isn’t displaced as with kettlebell. The cornerbell relieves some of these problems due to the fact that it has a fixed end, so it’s much more stabile. It will require some practice to determine the best way to position yourself near the cornerbell, especially since this exercise requires more floor space than others. Unilateral standing calf raise – the calves are strong muscles. Training them properly requires adding a lot of weight on top of your bodyweight. If you train at home and don’t have a calf raise machine, this eventually becomes a big problem, because doing it bilaterally requires placing an extremely heavy barbell on your back, which makes it nigh impossible to balance on plates/platform you use to get sufficient ROM. The only logical solution is to resort to unilateral training, and again you can use the cornerbell to provide stabile unilateral loading. A thing to consider here is how exactly to user the cornerbell. An obvious answer is to hold it in your hand, like you would a dumbbell. This is a good solution, and the only one if your bar is too short to reach up to your shoulder level – while you’re in the top position of a calf raise (standing on plates or a calf raise board). The drawback to this approach is that the length of your sets will be limited by your grip strength (which, of course, can be resolved by using straps). 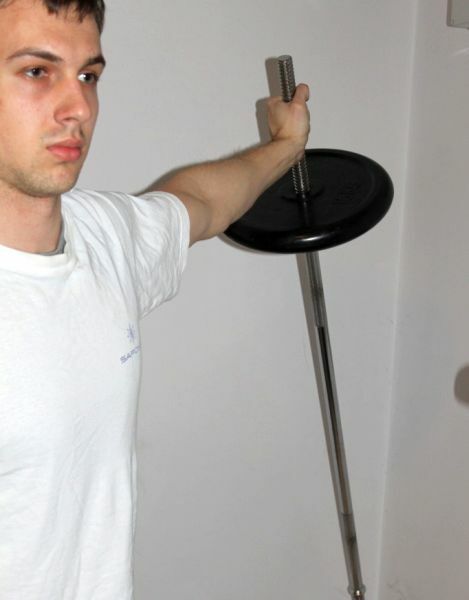 An alternative is to place the end of the cornerbell on top of your shoulder, and have it rest there during the duration of the set, but this solution suffers from a more severe problem (interestingly enough, people don’t think of this until they approach the cornerbell and try to do the exercise): how exactly are you going to get the weighted end of the cornerbell on top of your shoulders? This isn’t big a deal with unilateral presses mentioned in a previous section, as the weights you can press overhead unilaterally while standing or sitting without back support are quite light. You can easily pick the cornerbell, squat up, use both hands to get it to starting position, and then press. 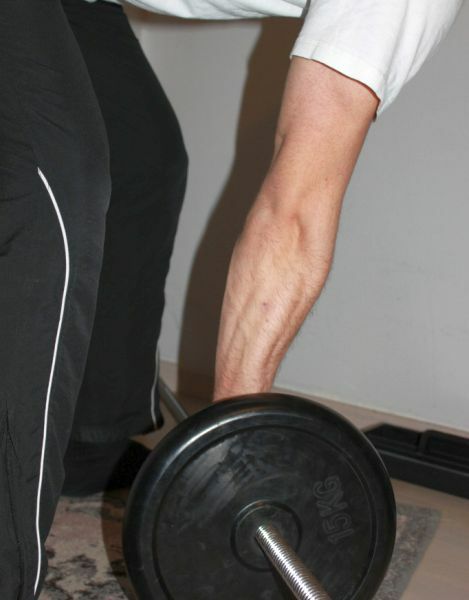 A unilateral calf raise for a strong man requires a 50+ kg DB. Depending on where you grip it, the cornerbell might need to be loaded with even more weight, one that is no longer safe for improvised racking. I therefore recommend sticking to the version in which you keep the weighted end in your hands. The cornerbell provides trainees with limited equipment with a safe and efficient tool for unilateral training. This is done by making the exercises which could be done with a barbell much easier and safer to perform, as well as bringing in some exercises which resemble dumbbell ones in the freedom of wrist positions and used range of motion. The exercises shown above are only examples of what is possible with a cornerbell, but coming up with new ones isn’t as hard as you’d think – if an unilateral exercise requires a dumbbell, it can quite possibly be done with a cornerbell with a little imagination and practice. Stay strong, train smart! Didn’t you wear that same shirt in another article? Ideally, at the starting point, the bar should be more inclined to the floor, which would then translate into a more noticeable overhead press at the end. I only have a 5′ standard barbell, and, as you can see, can’t use it for these cornerbell exercises even when I’m sitting on my heels, as I am in these pics. So, someone having access to an Oly bar, or a lot shorter than me, should be able to get a better ROM, more similar to an overhead press.